March 28, 2018 – After used nuclear fuel is removed from a reactor, it emits heat for decades and remains radioactive for thousands of years. The used fuel is a mixture of major actinides (uranium, plutonium), fission products (mainly assorted metals, including lanthanides) and minor actinides (i.e., americium, curium and neptunium). After the cesium-137 and strontium-90 fission products decay in a few hundred years, the minor actinides and plutonium generate the most heat and radioactivity. Removal of the minor actinides, especially americium, can help nuclear power producers reduce and better manage the waste stream. A team at the Department of Energy’s Oak Ridge National Laboratory has designed and synthesized a selective molecular trap that can separate the minor actinide element americium from a mixture of americium and the lanthanide elements, using europium as the model lanthanide in experiments. Whereas recovered americium could be burned in nuclear reactors, lanthanides are “neutron poisons” and must be disposed of in a geologic repository to decay. “Nuclear energy, to reach a state of sustainability, will require used nuclear fuel to be recycled,” said Bruce Moyer, leader of ORNL’s Chemical Separations Group and the paper’s senior author. This feat would require separation of minor actinides. The ORNL research identifies an inventive method for selectively and efficiently separating them. Improved separations would enable a closed nuclear fuel recycling option—a tantalizing prospect considering the United States uses only 1 percent of the potential nuclear energy of the uranium that it mines and currently does not recycle nuclear fuel. 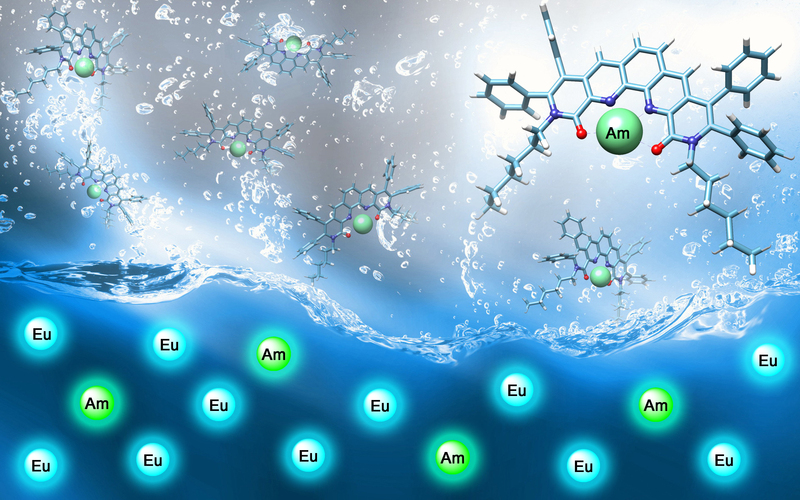 Designing and synthesizing an organic compound to strongly bind americium in the presence of europium required teamwork that is characteristic of a national lab. Collaborators included theoreticians Alexander Ivanov and Vyacheslav Bryantsev; organic chemists Jansone-Popova, Ilja Popovs and Madeline Dekarske; structural characterizations chemist Radu Custelcean; and separations chemists Frederick Sloop and Moyer. A chemical compound (called a ligand) can bind a metal atom. For high selectivity in binding, the metal and ligand must align, as a key must assume a certain orientation before it can enter a lock. In 2015, ORNL’s Bryantsev and Ben Hay hypothesized and demonstrated computationally that very rigid ligands containing four electron-donating atoms would be ideal for sequestering actinide atoms that are trivalent (have a net positive charge of three). When the ORNL chemists set out to test this idea experimentally, they immediately encountered a significant problem. Such ligands had never been reported in the scientific literature; they would have to be designed and synthesized from scratch. Moyer suggested creating a ligand that was saturated (i.e., contains single bonds) and preorganized (positions atoms optimally for binding a metal). Theory-based calculations of Bryantsev and Ivanov confirmed that this preorganized ligand would separate americium from a mixture of americium and europium. The team turned to Jansone-Popova, an expert in total syntheses of complex molecules, to generate a new family of ligands. Popovs helped identify the best synthesis routes, and Dekarske, an intern from Agnes Scott College, made starting materials. Custelcean solved the crystal structures of final products. Jansone-Popova created the saturated form of the preorganized ligand—a cyclic amide containing a nitrogen atom and a carbon double-bonded to oxygen. Then she introduced a double bond into that amide ring system to create an unsaturated cyclic form. In a ligand that is not preorganized, chemical groups called pyridines face away from each other. Introducing a nitrogen base preorganizes the system so that pyridines face in the same direction. The resulting tetradentate (“four-toothed”) ligands contained atoms that are strongly attracted to positively charged ions and donate electrons. The designed ligands feature two nitrogen and two oxygen atoms that coordinate with the americium metal. In the radiochemistry lab, experiments showed both saturated and unsaturated ligands strongly bind americium and europium. However, only the unsaturated ligand was impressively selective for americium. Computations revealed that the ligand’s rigidity is crucial for selectivity. This work was supported by the Fuel Cycle Research and Development Program of DOE’s Office of Nuclear Energy and used resources of the National Energy Research Scientific Computing Center, a DOE Office of Science User Facility.